Although the canoe was a principal means of travel in ancient Hawai`i, extensive cross-country trail networks enabled gathering of food and water and harvesting of materials for shelter, clothing, medicine, religious observances and other necessities for survival. Ancient trails, those developed before western contact in 1778, facilitated trading between upland and coastal villages and communications between ahupua‘a and extended families. These trails were usually narrow, following the topography of the land. Sometimes, over ‘a‘ā lava, they were paved with water-worn stones. Before 1778, land travel was only foot traffic, over little more than trails and pathways. The missionaries, who arrived in April 1820, selected their key stations and localities based on their accessibility via the ala loa (long trail) and smaller ala hele (paths) from neighboring ahupua‘a. The mission stations generally coincided with the traditional chiefly centers, which by that time, were also developing as trade points with foreign vessels. Bridges also became necessary. Perhaps the first was a footbridge across the Wailuku River in Hilo, described in 1825. The first important span on O‘ahu was the Beretania Street bridge built over Nu‘uanu Stream in 1840. By the 1830s, King Kamehameha III initiated a program of island-wide improvements on the ala loa, and in 1847, a formal program for development of the alanui aupuni (government roads) was initiated. Sidewalks were constructed, usually of wood, as early as 1838. The first sidewalk made of brick was laid down in 1857 by watchmaker Samuel Tawson in front of his shop on Merchant Street. In 1892, Queen Lili`uokalani and the Legislature of the Kingdom of Hawai`i signed into law an “Act Defining Highways, and Defining and Establishing Certain Routes and Duties in Connection Therewith,” to be known as The Highways Act, 1892. The pioneering highway in Hawai‘i was the Mauka Arterial (later christened Lunalilo Freeway). The three ‘Ewa-bound lanes, extending one mile between Old Wai‘alae Road and Alexander Street, were opened to traffic November 9, 1953. The Kaimuki-bound lanes along the same stretch were opened and the highway was formally dedicated on January 5, 1954. 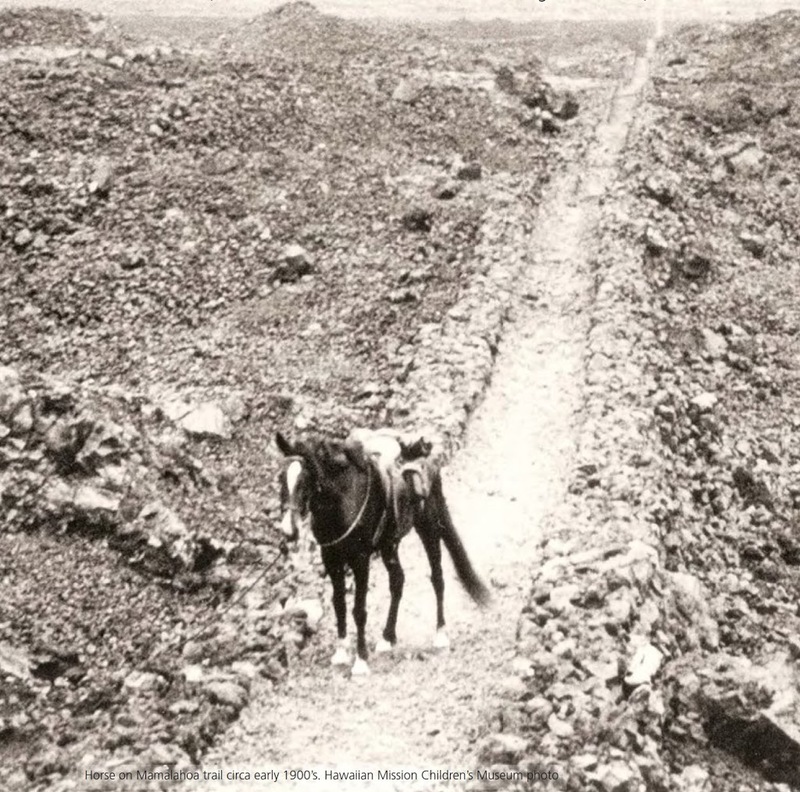 This photo shows Māmalahoa Trail in North Kona, as a horse trail in the 1900s (HMCS-NPS.) In addition, I have posted some other trail images (and some evolutionary stages of various trails to roads) in a folder of like name in the Photos section on my Facebook page.